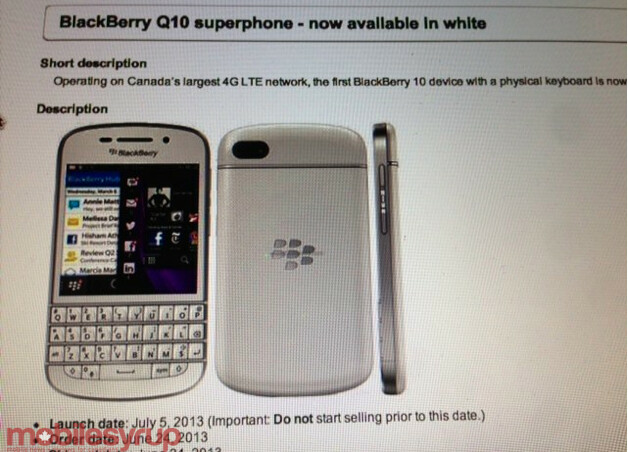 It's all white now: Bell to offer BlackBerry Q10 in white on July 5th? 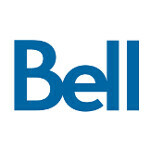 The QWERTY-equipped BlackBerry Q10 is coming to Canadian carrier Bell starting July 5th based on the information written on a leaked internal document. Currently, Rogers has an exclusive on the handset in the country, although that is obviously coming to an end. The price for the phone will most likely remain the sames as for the black model which is $199.99 with a three year pact, and $699.99 off contract. Long time BlackBerry users are expected to be more willing to give the Q10 a shot instead of the all-touch BlackBerry Z10, which launched first earlier this year. BlackBerry CEO Thorsten Heins explained his decision to lead with the Z10 by saying that he had hoped that the model would stop those 'Berry users in a BYOD business environment from swapping to an Apple iPhone or Android model. Instead, most fans of the platform said that they were waiting for the trademark BlackBerry QWERTY on the BlackBerry Q10. BlackBerry is set to report its fiscal first quarter earnings report on Friday and analysts are divided over whether or not the Canadian OEM will top expectations for the three month period. There is a lot at stake here as the report will provide analysts with a clue about how well-received the first two BlackBerry 10 flavored models have been.